Usually Brisbane winter days are “beautiful one day, perfect the next” with clear blue skies. But somehow the advertising went wrong just in time for the Unlock the Past Expoat Jindalee. What dreary grey wet days they were but luckily for all the genealogists there was lots of warmth inside to toast our spirits. So many excellent speakers on a diverse range of topics made for a smorgasbord of learning opportunities to suit any interest. 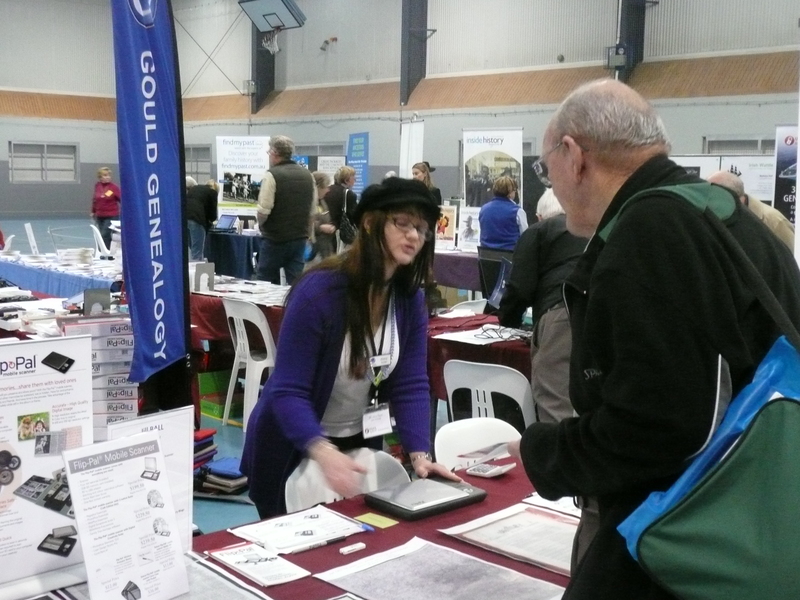 Alona from Gould Genealogy discussing the wonders of the Flip-Pal which seemed to be one of the hits of the Expo. I surely love mine! I hadn’t expected to be at the Expo so it was all a bonus from my point of view and when challenged by competing options I had to select speakers who I don’t often/ever get to hear in Darwin. Luckily Shauna Hicks and Rosemary Kopittke presented on a range of topics in Darwin earlier this year, and Shauna usually visits annually, so that left me free to listen to new presenters though I know others really enjoyed their talks. Kerry Farmer presented on DNA for genealogists and as I’m belatedly dipping my toes in the genetic-testing pool, I had a lot to learn. I also have Kerry’s Unlock the Past book on DNA so I can reinforce her talk with further reading when I get home. I need to think further on which form of DNA testing can advance my own (and Mr Cassmob’s) family history. Graham Jaunay emphasised the importance of considering photographic techniques and mountings in preference to clothing styles to date photographs. His information on how people were posed for photos was particularly helpful. Helen, Carole and Kerry providing advice in the Research Help Zone. 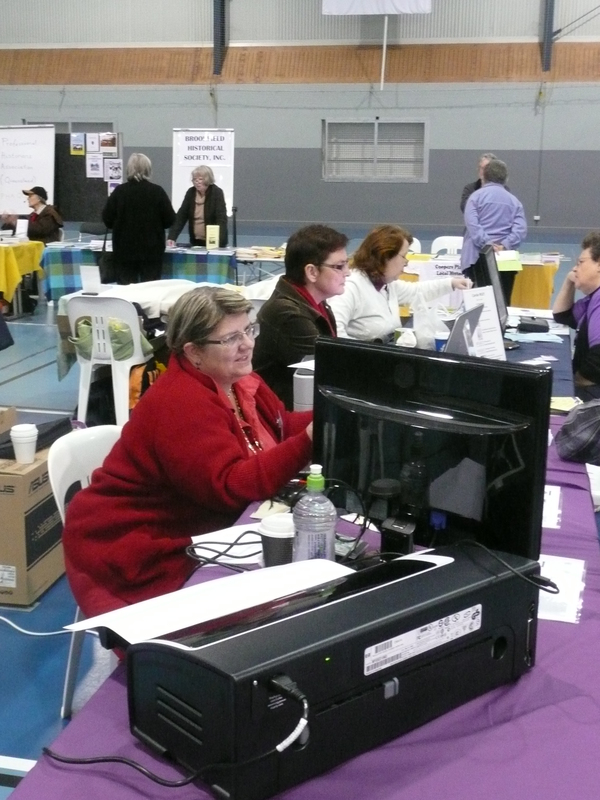 I also took the opportunity to learn a little more about The Master Genealogist software program in the Research Help Zone. I have a strange aversion to genealogy software but Kerry has pretty much convinced me to change my ways. I was disappointed in the talk on Crack Hardy as I felt it needed at least a few photos to illustrate the people and places being discussed, enabling the listeners to engage with the men more. It was plainly a good story but from my point of view I felt the strongest parts of the story got lost among other details. Monday was a long day and Helen Smith’s was the final presentation I attended. It’s not easy to keep people engaged at 8pm when they’ve been going all day, but Helen managed it. Her talk was informative and interesting and her presentation style certainly kept me alert. There were many reminders to us about how we can break down those much discussed brick walls, with Helen querying whether this is really a misnomer and we just need to reframe the problem. Key points were to review++ all the documents we have for that person/family, prepare a life timeline, write out our brick-wall questions and if still going nowhere, consult another researcher who may easily spot that really obvious tree that we keep overlooking in our research forest. Given I’d missed Helen’s batch of talks in Darwin last Saturday due to family commitments in Brisbane, I was really pleased to have this opportunity to hear her speak. Lauren Penny and the eye-catching display for her St Helena book. 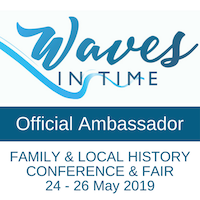 The same commitments meant I could only attend a couple of presentations on Tuesday morning and I chose Cassie Mercer’s talk on Captain Starlight and Carole Riley’s on land records and I thoroughly enjoyed both. Cassie’s engaging story kept me entertained throughout even though I already knew the essential details. Little did I know though that Harry Readford was her ancestor. Ted Egan, former Administrator of the Northern Territory, has written a song about CaptainStarlight, which is on his CD album The Overlanders (warning: these songs will stick in your brain and go round and round). Carole Riley’s talk on land records helped demystify a variety of land records and clearly illustrated just how useful they can be to your family history. I always feel somewhat out of my depth using land records even though I’ve used many, so it was good to have an expert show the way. 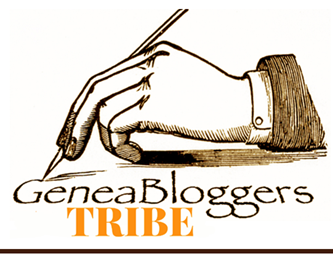 The Expo was also a great chance to meet with my genie blogging mates whom I’ve only known virtually. I did miss a couple (Alex and Tanya) but had a chance to say a quick hello to the others and a longer chat with some of them, which was fun. We even squeezed in a photo which you can see on Alona’s Lone Tester blog. 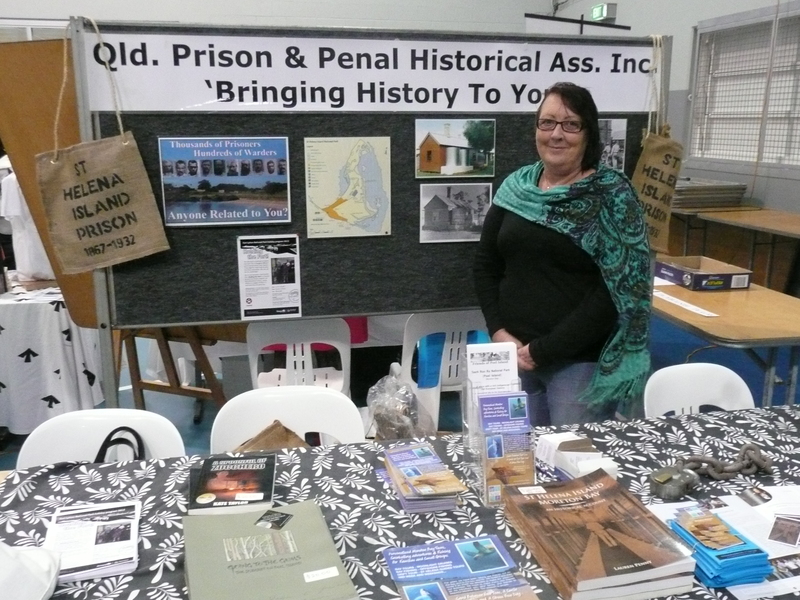 One of the exhibitors was Lauren Penny, author of St Helena Island, Moreton Bay: an Historical Account. As my ancestor had a short excursion in St Helena Gaol this was of great interest so I bought a copy of the book which is going to be great reading for my family history. 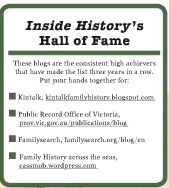 Also great to catch up again with an all-too-quick chat with Judy Webster, an expert on Queensland research as well as founder of the Genealogists for Families team on Kiva. All in all, a fantastic opportunity to be part of the genie fun in Brisbane this week. Thanks Unlock the Past, all the speakers and all the exhibitors! Not to mention the caterers and that poor overworked man on the coffee van (his coffee and hot chocolate matched the standard of the talks)!